In April 2014, the Academy Award-nominated movie Virunga caused a worldwide outcry against the oil extraction in DR Congo’s Virunga National Park, a UNESCO World Heritage Site and home to the world’s last mountain gorillas. Only several weeks later, oil multinational SOCO International agreed to withdraw from Virunga and eventually sold its production shares in Bloc V, an area covering over one third of the park. Apart from the Virunga fimmakers, NGO heavyweights Human Rights Watch, Global Witness, the WWF, and some brave park wardens mentioned in the movie, who else was standing up against SOCO? Moreover, who else suffered from SOCO’s activities, apart from the gorillas and the rangers? And, most importantly, was this really the end of the story? First of all, it should be made perfectly clear that not only the park’s flora and fauna – and most prominently the gorillas – were negatively affected by SOCO’s presence and would suffer from any future oil extraction. In fact, the security forces assigned to the company targeted the people living in and around Virunga much more directly. At least in this regard, Virunga is definitely not telling the whole story. Apart from several park rangers mentioned in the movie, in early 2012 a vibrant network of various environmental and human rights organizations, civil society groups and even local authorities from eastern Congo started to mobilize against SOCO’s exploratory activities. The scope of the problem and the nature of the people’s grievances can be grasped by looking at the dozens of local petitions issued between 2012 and 2016. In the same document, another representative points out that SOCO used community members that were involved in armed conflict before to “convince” (ergo: intimidate) their fellow citizens to agree to the oil project. In several of their petitions, the activists list a number of incidents of intimidations and arbitrary arrests of protesting community members, activists and park rangers by Congolese security forces and point out that these activities were directed by the SOCO-FARDC liaison officer, Major Feruzi. In June 2014, the WWF and SOCO signed a joint declaration in which the company pledged to withdraw from the park and the WWF agreed to withdraw its complaint before the OECD. Criticizing the fact that they had not been involved in the negotiations and suggesting that SOCO was just fooling the WWF, several local NGOs pointed to the risk of retaliation from community members previously anticipating money from the oil business. A lack of communal participation was in fact one of the topics most frequent highlighted in the petitions. Most letters criticize that SOCO and the Congolese government did not consider local concerns about the oil exploitation. Importantly, the activists frame their grievances, especially concerning participation and conservation, but also the bribing of security officials, in legal terms: In two petitions, the authors request SOCO to adhere to the principle of Free, Informed and Prior Consent when implementing an environmental and social impact study. Furthermore, in their letter to the governor of North Kivu in September 2013, local activists demand SOCO to respect the laws of the republic and the principles of the Extractive Industries Transparency Initiative. In their letter to the British law firm Clifford Chance, tasked with the investigation into allegations of misconduct by SOCO employees, local activists claim that the oil company violated the 2010 UK Anti-Bribery Act. Local accounts of the company’s activities suggest that SOCO actually never planned for the inclusion of local concerns into its agenda; it only tried to manage them by offering wardens, activists and community leaders beer and money. Furthermore, while SOCO explicitly refers to the “requests” and “needs” of the local communities, the company apparently never responded to the local petitions – in stark contrast to its responsive approach towards Global Witness and Human Rights Watch. Even more concerning is the fact that while SOCO acknowledges that the local people suffered from a long history of violence over natural resources, it does not reflect on its own (potentially negative) role in this context and is willing to burden the local communities with the risk of more violence. So, what follows from the company’s withdrawal from the park in the summer of 2014? There is no simple answer to this question. Immediately after its joint statement with the WWF, SOCO assured the Congolese government and its own investors that it would continue pursuing its plans for future exploitation. In mid-2014, one former company employee even accompanied the Congolese oil minister to a UNESCO meeting in Doha, trying to convince the organization to redraw the boundaries of the park to pave the way for future oil exploitation. 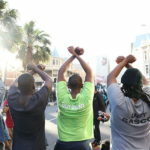 The Congolese government had originally asked the company to finance the delegation’s trip to Qatar, but SOCO insists to have turned down this request. While the UNESCO commission was apparently not amused and SOCO eventually sold its share of Bloc V, in 2016 the Congolese government doubled its efforts to start oil exploitation in Lake Albert and Lake Tanganyika and drilling for methane in Lake Kivu. While these lakes are not protected by the same strong conservation laws as Lake Edward in Virunga, they are still part of the eastern DR Congo’s complex conflict system. In fact, the two Kivu provinces form the epicenter of a complex web of violent interactions of over 70 armed groups, including the Allied Democratic Forces (ADF) and the Forces democratiques de liberation du Rwanda (FDLR). Likewise, Lake Albert’s Ituri province features the notorious Force de résistance patriotique d’Ituri (FRPI) and just recently witnessed the birth of a new rebellion: the Union des patriotes pour la libération du Congo (UPLC). The militarization of communal life with its reproduction of informal protection networks often featuring the involvement of powerful national and international actors is one of the central causes and consequences of the ongoing stability of eastern Congo. And natural resources are one of the reasons why armed actors can sustain their activities for such a long time. Hence, to raise the stakes for conflict in this fragile region is a very bad idea. The discovery of oil in Lake Albert already displaced thousands of people that had their livelihoods ruined due to exploration drills by the companies Total and Tullow. Furthermore, in recent years all four border lakes have seen soldiers from one country violently attacking fishermen from the other side. Indeed, Congo’s government is under financial pressure, especially after the fall of global commodity prizes and the subsequent withdrawal from some important international investors. One aspect of this financial crisis is the government’s claim to be unable to finance the general election originally set for November 2016. But as long as the country does not diversify its revenues, putting an end to its dependency on primary commodity exports, Congo will never be able to create a stable economy. It is important to note that not all petitions by eastern Congolese activists against oil exploitation were against oil extraction per se. But in those rare cases where oil was seen as a possible source of local development, the petitioners always demanded a strong say in the entire decision-making process. 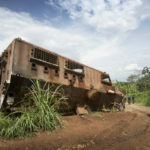 If this demand for more participation and transparency in the planning and implementation of oil and gas exploitation in the Albertine Rift is not satisfied by the Congolese (and increasingly the Ugandan) authorities, the communities living in the areas of exploitation will probably witness a further proliferation of armed groups and hence a further increase in violence. 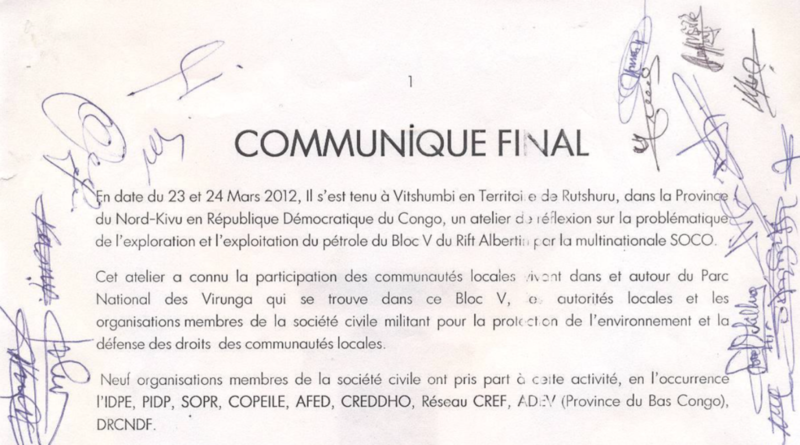 The petition shown in the picture above was produced, among others, by the CSOs IDPE, PIDP, SOPR, COPEILE, AFED, CREDDHO, Réseau CREF, ADEV, and DRCNDF on March 24, 2012.